More Designer Silk Scarves For Your Enjoyment! Designer Silk Scarves For You or as Special Gifts. More designer silk scarves - by popular demand! Friends and clients have been asking me for a choice of colours of the luxurious silk scarves that I have been designing and having printed by the best artisans in Australia. The scarves are perfect for those who appreciate top quality, who want to be a little different to everyone else or who are looking for luxurious, small gifts for special friends. 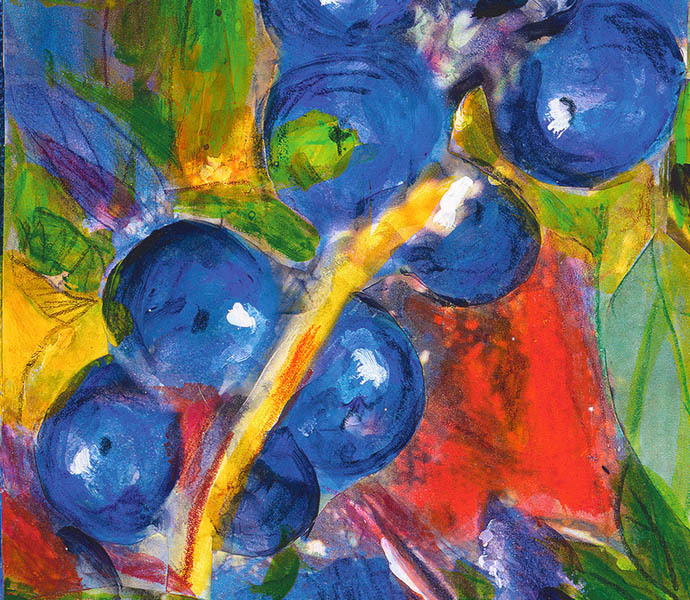 For twenty or more years I have hand painted silk scarves, their pure hues reminding me of the brilliance of coloured glass, suspended in time. 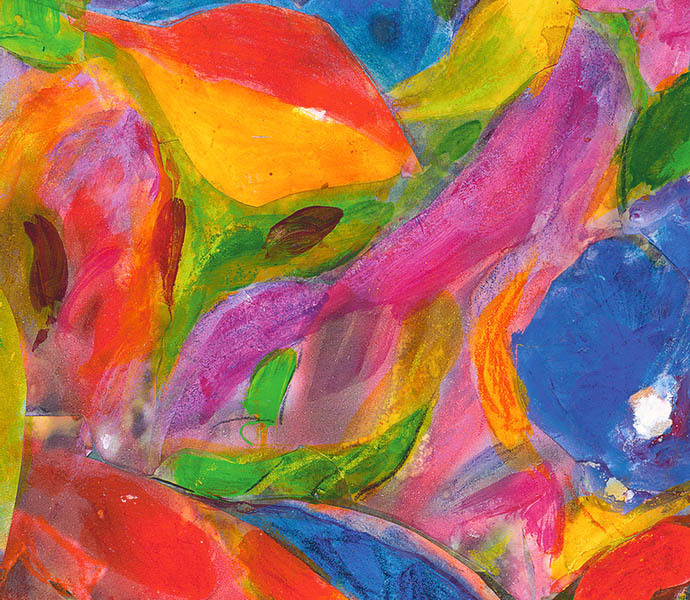 It is the color in art that most interests me. By developing designs that can be carefully reproduced on pure silk I am able to offer quality controlled art pieces to a wider, online audience, in addition to occasional 'one-off' hand-painted wraps or silk lengths. Designs were developed from photographs and drawings of flowers as well as from abstract paintings. Starting as a collage of images and textures, each scarf became an oil painting, which was then scanned and printed on pure silk. 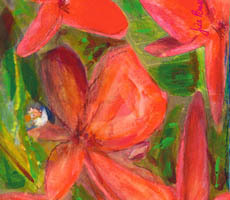 Tropical flowers become designer silk scarves. Below are photos, true to scale of each scarf in this tropical flowers series of designer silk scarves. They are approximately 150 cm long and 25 cm wide - perfect for a variety of fashion statements - and excellent value ($95 each, incl postage in Australia). It's a pity that I can't pop a little sample of this gorgeous silk through your computer screen so that you can feel its luxurious 'handle'. However, you may click on images below each long scarf to see details. I have included a 'detail' of a section of each scarf, so if you click on that you will see an enlargement and be able to appreciate the drawing, painting, textural and colour qualities of each. 'Tropical Flowers 1 - Blues' - deep blues with a touch or green, red and yellow. The round, blue berries are not in my garden yet, although the native ginger plant, which produces them, is. 'Tropical Flowers 2 - Riot of Color' - this mixture of colours and flowers from my garden would complement almost any outfit! Then compliments are sure to flow! 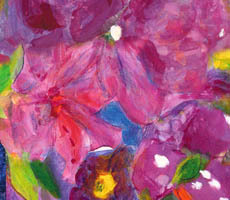 'Tropical Flowers 3 - Azaleas' - purples, maroon and mauves of hardy azaleas are complemented by deep blues with just a tiny contrast of greeny-yellow. 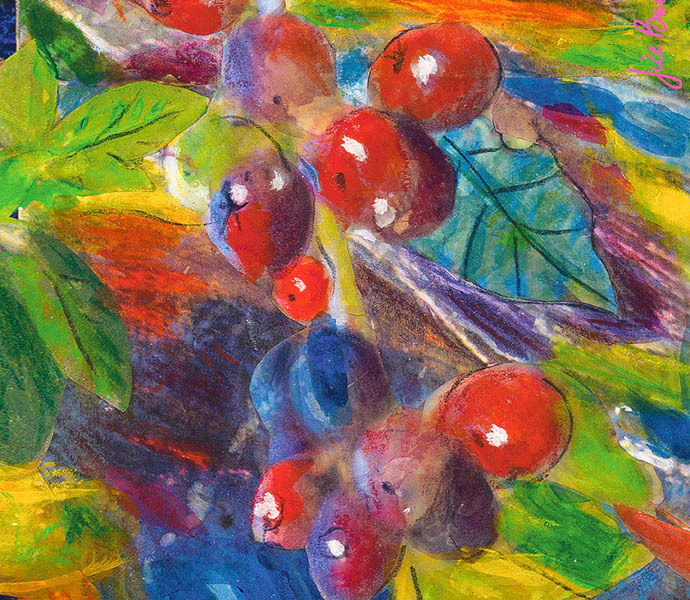 'Tropical Flowers 4 - Coffee Beans' - the deep reds of ripe coffee beans, which grow in my garden, are offset by red's complementary color, green, as well as blues and a touch of orange- yellow. 'Tropical Flowers 5 - Red Frangipanis' - this is my impression of red frangipani flowers growing in my garden. Aren't they spectacular? The leaves are less glossy than the creamy ones and also are pointed rather than spatulate. See what happens when you click this image! 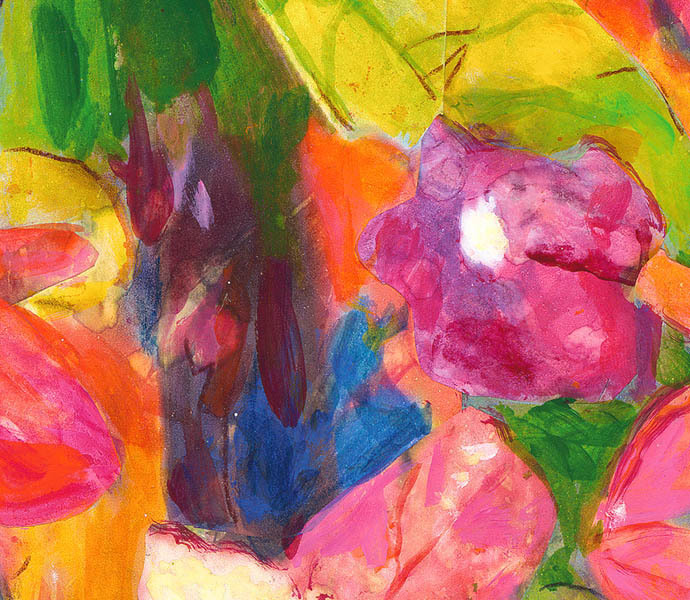 'Tropical Flowers 6 - Corals' - this bright and happy scarf design emphasises corals and pinks - see how the yellow/green contrast gives it a lift? 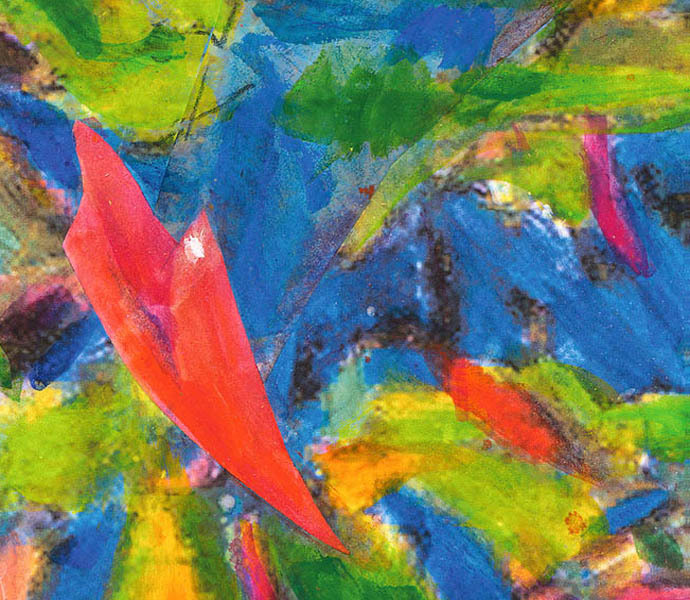 This 'Tropical Flowers 7 - Heliconias' scarf has more of an abstract look - an impression of the riot of colour, as well as movement, in tropical gardens. 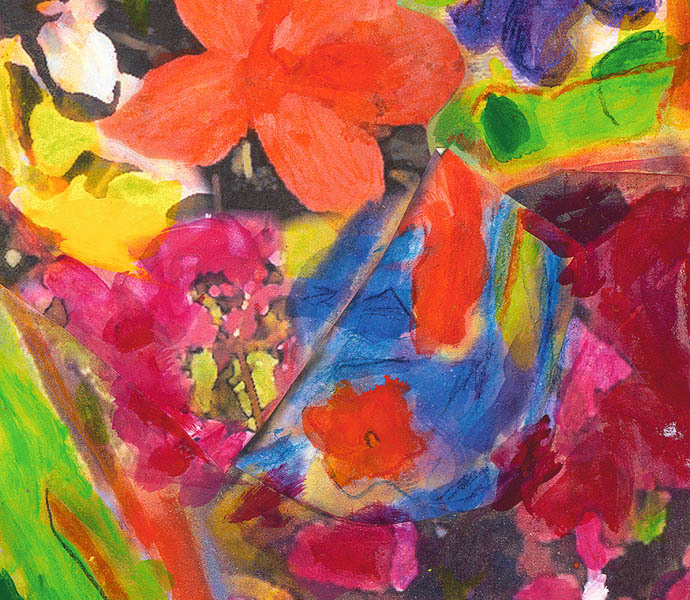 'Tropical Flowers 8 - Multi ' merges elements in several scarves, above, as well as being multi-coloured, although dominant colours are in the red ranges. 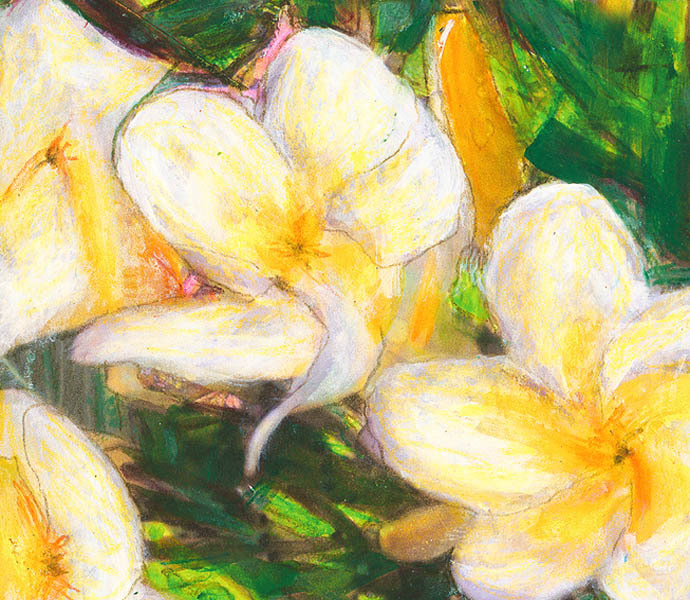 'Tropical Flowers 9 - Cream Frangipani' depicts the creamy, perfumed, evergreen frangipani that grows in my garden. Although you can't really tell from this painting, the shiny leaves are spatulate shaped at the tips. This might be my favourite flower. 'Tropical Flowers 10 - Poinciana' gives a glimpse of the brilliant, red petaled poinciana flowers that appear on the spreading branches of shady trees in November and December each year. Aren't they gorgeous? 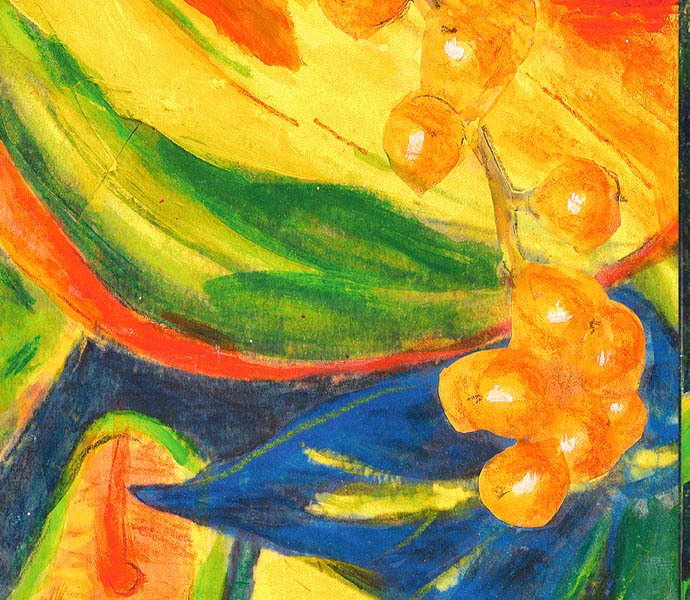 'Tropical Flowers 11 - Crotons' depicts the coloured leaves of the croton bush, with a spray of the golden berries from a mauve coloured flower, the name of which I need to discover! 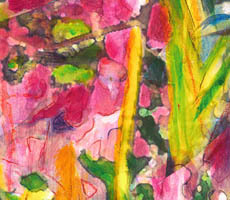 'Tropical Flowers 12 - Bougainvillea' This scarf painting is based on an abstract painting about the jungle that lines the beach where I live, overlaid with an impression of red, pink and purple bougainvillea flowers from my garden. These designer silk scarves, featured above, are all printed on high quality habotai or crepe de chine pure silk, which is soft and springy to handle, with an understated lustre. They measure approximately 25cm x 150cm, so are a generous length and width. NB: Have you ever seen the term 'art silk' used? 'Art', used to describe silk is short for 'artificial' so is very likely made from synthetic fibres. It may be processed in a manner to give it a shiny, 'silky' finish - but don't be fooled, it's not 'the real deal'! I user only pure silk (made by silk caterpillars, which then become moths). If you are a member of this website (automatic when you sign up to receive the bi-monthly newsletter) the cost of your silk scarf will include express postage within Australia. Members, please contact me via the form below to arrange this. I will deduct $10 from the cost of postage to other countries. Please contact me via the form below to arrange. JUST IN : Smaller silk scarves - 16cm x 96cm in the Tropical Flowers designs, above, using the same high quality habotai silk. Only $46. FREE postage within Australia, $25 to another country for up to 3 scarves in the same order. The scarves make lovely gifts as do matching drop earrings made (by me!) from sterling silver and glass. See these youthful ideas about how to tie scarves - and send us yours? This range of scarves are available exclusively from this website or from Jungle Road in Port Douglas - Shop 5/51 Macrossan Street. Jungle Road has been providing discerning clients with natural fibre clothing for many years; if you are a repeat visitor to the town you will most likely have Janette's shop down on your 'must see' list. NEW - even newer! - is this Spirit of Oz website that extends the range and sizes of pure silk scarves made in Australia - by Jill, with help from brilliant technicians. Enjoy! Your comments and suggestions about this new format will be welcomed. 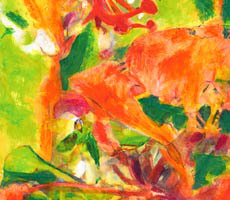 Would you like to enquire about or order any of the ginger flowers silk designer scarves by Jill Booth?